The Elmhurst and Touhy intersection in Elk Grove Village will get an $11 million treatment to add a bypass lane. In its upcoming update of the GO TO 2040 comprehensive regional plan, the Chicago Metropolitan Agency for Planning needs to take a closer look at the transportation projects it funds with federal Congestion Mitigation and Air Quality grants. In the latest round of these grants, announced Tuesday, CMAP committees have approved funding for nine projects that only add more space for cars. The Regional Transportation Operations Coalition, a consortium of transportation agencies and consultants that makes recommendations to CMAP, selected several projects that add turn lanes at intersections. These funds are supposed to be used to reduce vehicle pollution, because Chicagoland air quality does not meet the standards set out in the Clean Air Act. The best way to do that using transportation infrastructure is to make walking, biking, and transit more appealing to people relative to driving. While each road expansion project is presumed to reduce traffic congestion at that specific location, the broader effect is to induce more driving and discourage transit use. And increasing transit ridership is supposedly a major goal of CMAP’s GO TO 2040 regional plan. This year, road projects comprise 35.2 percent of Congestion Mitigation and Air Quality funding, an increase from the 25.7 percent share in 2012. According to CMAP’s own analysis, all of these road projects will have “no benefit” when it comes to reducing solo driving trips or traffic in general [one, two]. Meanwhile, all bike/ped/transit projects are projected to have a positive impact on reducing traffic and SOV trips. The good news: CMAQ funds will pay for construction of the Union Station transportation center at Jackson/Canal, with underground walkway to the Great Hall. Granted, these road projects may yield some improvement to the speed and flow of bus operations. But the overall effect could still work against transit: By creating more space for driving, people will drive more in these places, which can slow down buses. And just as important, all the money spent on these road projects cannot be invested in ways that will definitely improve transit, biking, and walking. 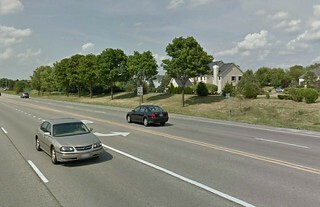 A bus stop without a sidewalk or waiting area along suburban Randall Road. Photo: Google Maps. “Arterial Rapid Transit” bus service on Milwaukee Avenue from Jefferson Park CTA Blue Line in Chicago to Golf Mill mall in Niles. 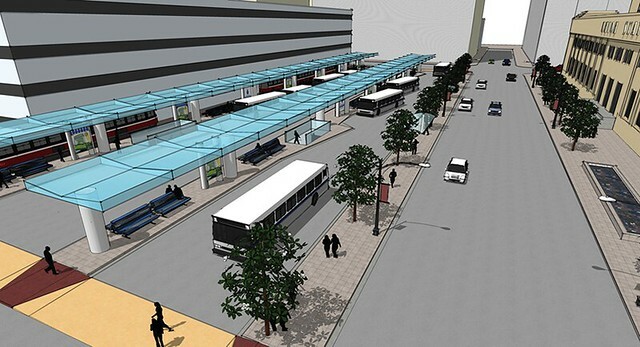 The project will have transit signal priority (like Ashland BRT), branded buses (like the J14 Jeffery Jump), stations, and real-time info at stops. Reconstruction of two Chicago Transit Authority stations, Monroe Red Line and State/Lake elevated. A faster 66-Chicago bus. Signalized intersections on Chicago Avenue from Austin Avenue to Orleans Street will be upgraded to give CTA buses priority. Union Station transportation center at Jackson/Canal, with underground walkway to the Great Hall for smoother, weather-protected connections to several bus routes, including the upcoming Central Loop BRT. An extension of the Chicago River riverwalk with an underbridge connection at Addison Street. That’s the good news, but it’s difficult for transit to gain ridership or biking and walking to increase when we continue to heavily fund driving.